This page will explain how to bulk import or export fee schedules in TRAKnet. Fee Schedules in TRAKnet are a method that allows the user to set up a different charge amount for each individual insurance company in the database on a per insurance level. For example, a practice charges $100.00 as a base price for a 11721. However, Medicare dictates they must charge $50.00 for this code. Fee schedules allow the user to tell TRAKnet that any time Medicare is the insurance company on a claim, $50.00 is to be charged. 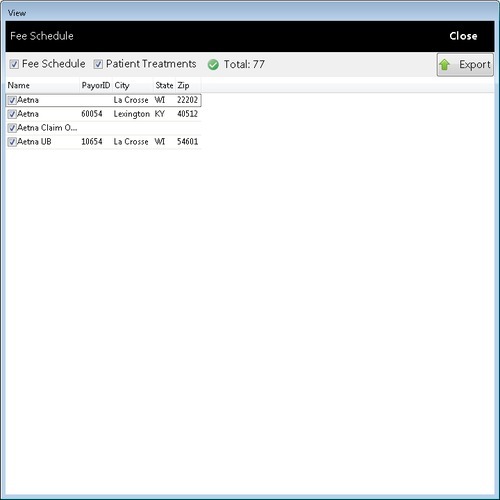 Fee schedules can be set up individually per treatment code by going to Properties > Treatments > Modifying a treatment code > Fee Schedule tab; however, this wiki page will discuss bulk importing and exporting of fee schedules to update multiple treatments at a time. To export your current fee schedule, click on the Properties tab > Insurance > Search for the insurance companies you would like to export the fee schedules for. Note: Export is only available when search results are available on the screen. Only the insurance companies listed will be exported and only treatments which have charges will be exported. Users can manually select/deselect entries. All checked entries will be part of the exported file. If “Fee Schedule” is checked, then all treatments that have a fee schedule entry, regardless of insurance company will be exported. If “Patient Treatments” is checked, then all treatments that have appeared on a patient invoice will be exported. If both are checked, codes will not duplicate if they qualify under each checkbox. The “Total” label will show the count of treatments that will be exported. If either are checked, then a “Green” check appears. If both “Fee Schedule” and “Patient Treatments” are unchecked, then all treatments will be exported. This list may be quite large so the “Total” label will show a “Red” X as a warning with the count. The user won’t be stopped but the manipulation of the export file may be cumbersome. When the user exports the list, any applicable amount for a treatment that is part of that insurance’s fee schedule entry will be exported. For example, insurance A has a fee schedule for 99201 in the amount of $100, so that is the amount exported. If no fee schedule entry, then entry will be blank. By default, code, description and price will be exported per treatment. Then each column afterwards is represented by the insurance company. “Exact Match” - One and only match based upon insurance name. “Selected Match” – Either multiple or no matches, so user selected an existing insurance company. 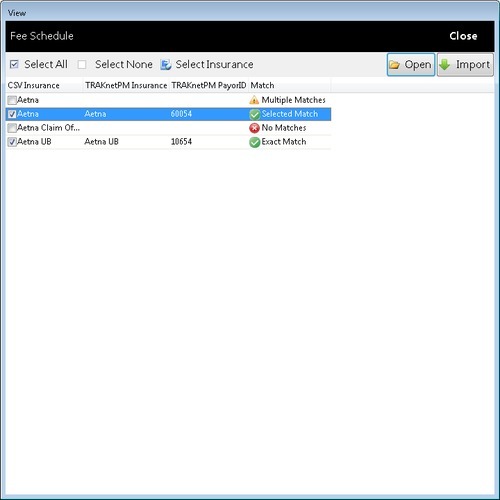 Multiple matches to an existing insurance name. No matches to an existing name. If yellow or red, the user must “Select Insurance” to match to an existing entry in TRAKnet. Until an entry is associated with an existing insurance company in TRAKnet, the entry can’t be checked. If unchecked and attempting to check, the “Select Insurance” will display. The user will be allowed to “Select Insurance” on any green entry, even if “Exact Match”. Each entry can only be associated with one existing insurance. 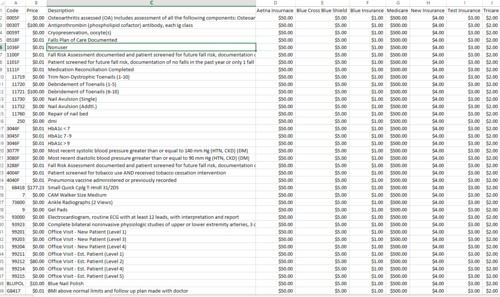 If a treatment is found and the price field is populated, then the respective treatment in the database will be updated. This will affect all treatments that match the code. If a treatment is not found, a treatment will be created from the code, description and price. If no description, then a default description of “Pending” will be used. If no price, then $0.00 will be used. Fee schedules will be created appropriately. If a “price” is populated under the insurance’s column for the respective treatment, then the existing fee schedules will be updated for each entry based upon the code. If a fee schedule doesn’t exist, it will be created. If a “price” is not populated, then no fee schedule will be created or updated. Once the import is complete, the user will be notified.